Ralph Arthur Pardington completed his life’s journey Sunday, August 19th 2018. Born in Detroit, Michigan June 14th 1938, he was the only child of Raynor and Verna Pardington. After graduating from Albion College (1960) and Cranbrook Academy of Art (1962), he became Chairman and later Head of the Three Dimensional Art Department at the Institute of American Indian Arts (I.A.I.A.) in Santa Fe, New Mexico. In addition to teaching Ceramics at I.A.I.A., he supervised instruction in Jewelry, Ceramics, Native Crafts, Sculpture, Weaving, and Foundry Sculpture. He retired after 28 years. He was a brilliant artist and craftsman whose ceramic wares and sculptures were often recognized as outstanding in regional, national, and international exhibitions. He had many notable collections including The Institute of Contemporary Arts, Washington, D.C.; Museum of Fine Arts, Museum of Albuquerque, New Mexico; Museum of Fine Arts, Museum of New Mexico, Santa Fe, New Mexico; Fenn Galleries, Santa Fe, New Mexico; Los Alamos Medical Center, Los Alamos, New Mexico; and Monastery of Christ in the Desert, Abiquiu, New Mexico. He was recruited for private collections by many well-known people including Barbara Mandrel, Fritz Scholder, and former Texas Governor J.B. Connally. Always one for adventure away from the artist’s studio and classroom, he loved the outdoors and was active in Saint John’s Search and Rescue Team as well as Rocky Mountain National Mountain Man Rendezvous. 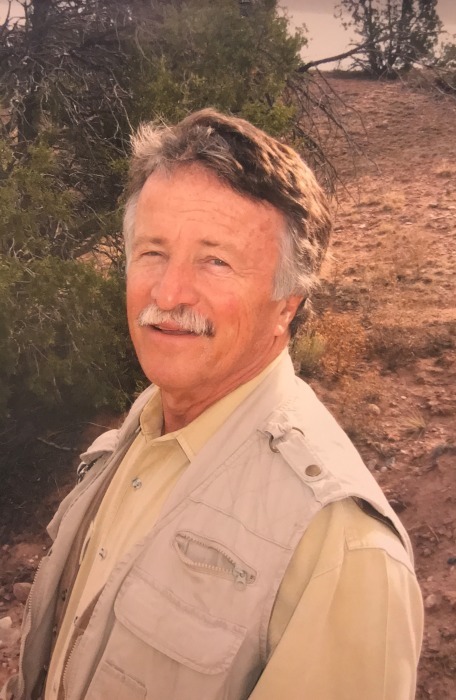 In his retirement, he set up experiential ropes courses across the nation for Pecos River Learning Center. He favored sleeping outdoors under the stars and a pile of wool blankets, on top of buffalo skins, next to a campfire and with his deeply adored canine companions. His keen sense of humor was typically characterized by a unique mix of wit and sarcasm to which even strangers could not take offense. He received great pleasure from playing pranks on unsuspecting victims, particularly his students. Halloween was one of his favorite holidays and he would dedicate seemingly endless energy into rigging various animated props to scare children upon their approach and arrival at his doorstep. Indeed the direct way to his heart was through his stomach. He was all about good cooks, good cooking, exquisite cuts of meats on the grill or slow roasted in the oven, green chili, homemade bread, deviled eggs, coffee and ice-cold water. He was never one to shy away from rich dairy products. Celebrations or special occasions called for treats like a red cream soda or some donut holes. He relished mixing odd combinations of food like bologna and blueberries. He was a great many things to many people. He was a father, husband, teacher and a fine friend who will be deeply missed. The family wishes to especially thank his care team for their loving dedication and tender care over the last year and eight months. A private interment will take place. For those wishing to express their remembrances and condolences, please visit the Tribute Wall at https://www.berardinellifuneral.com. In his memory and in lieu of flowers the family asks you to consider donating time or money to Santa Fe Animal Shelter & Humane Society http://sfhumanesociety.org/.